Reception at 3:00 p.m. Program at 4:00 p.m. Enjoy traditional Polish sausages with sauerkraut or salad-$5, homemade golabki-$2, pastries, sodas small-$0.5 big-$1, and Polish beer. Listen to lively Polish folk music. Our picnic shelter is next to the famous Creve Coeur bike trail and just 60 feet from the beach with beach volleyball courts. Kayaks, single and multi-person bikes, and paddle boards are all available at a nearby rental. Tree zip lines and kids playgrounds are located in the adjoining Upper Park. If you wish you can bring your own picnic blankets and lawn chairs. WSZYSTKIE ORGANIZACJE POLONIJNE i POLONIĘ z ST.LOUIS z RODZINAMI i ZNAJOMYMI. Będzie SMACZNIE (polska kiełbasa z kapustą lub sałatką-$5, gołąbki-$2, ciasta, soda mała-$0.5 duża-$1 i polskie piwo) i WESOŁO (ludowa muzyka polska). Można zabrać własne rowery, koce, leżaki i krzesła. W pobliżu (20m) plaża z boiskami do siatkówki plażowej oraz wypożyczalnia kajaków, desek do pływania, rowerów i wieloosobowych wózków rowerowych. Wokół jeziora biegnie dwukierunkowa ścieżka asfaltowa dla rowerów i do spacerów. W sąsiedztwie w Górnym Parku – park linowy i place zabaw dla dzieci. Mass at 4:00 p.m. Dinner at 5:00 p.m. The Polish Heritage Open is an annual event to raise funds to maintain the Polish Heritage Center at St. Stanislaus Kostka Church in St. Louis. All are invited to participate in this event. If you are interested please see the attached flyer for more information and the registration form. 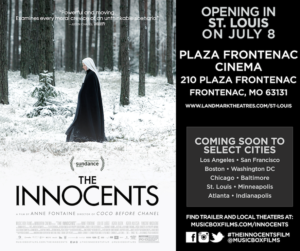 THE INNOCENTS Opens in St. Louis on July 8! On July 8th the Polish film “The Innocents” will open at Plaza Frontenac Cinema. The information about the movie and it’s showing is below. My name is Yasmine Garcia, and I am writing to you on behalf of Music Box Films. We are proud to announce that we are releasing THE INNOCENTS, directed by Anne Fontaine. The film will be opening at the Plaza Frontenac Cinema in St. Louis beginning July 8. Warsaw, December 1945: a young French Red Cross doctor is summoned to a local convent where she discovers several nuns in various states of pregnancy, facing an unprecedented crisis of faith as their fiercely private world clashes with harsh realities. Comments Off on THE INNOCENTS Opens in St. Louis on July 8! The Polish American Cultural Society proudly announces the Polonez Ball. The Ball will be held on October 11th, 2015 at Sunset Country Club in St. Louis County, Missouri. Join us in celebrating our Polish Heritage with delightful music, exciting dancing, enchanting debutantes, and wonderful guests. Reception at 4:30, Dinner at 5:30, followed by the Program. The Swieconka celebration at Glen Echo Country Club is on SUNDAY, April 12th at 3:00 P.M. Enjoy the Easter dinner in the luxury of one of St. Louis’ oldest and most historic private clubs. Invite all your friends and relatives to embrace their Polish culture with the PACS and return the attached reservation form with check to ensure your reservation. Questions call us at 314-868-6911.